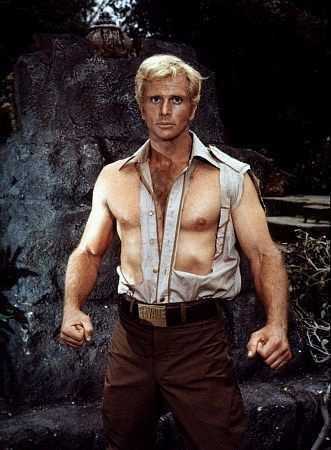 The old cliché “…so bad it’s good” springs to mind when one watches the 1975 cinematic release “Doc Savage: The Man of Bronze”. Based upon the eponymous 1930s’ pulp magazine character primarily written by Lester Dent the film was intended to be the first in a series of purposefully old-fashioned adventure movies by legendary Sci-Fi entertainment producer George Pal that would cash in on the then box office popularity of nostalgia-themed dramas like the Sting (1973) or Murder on the Orient Express (1974). Unfortunately Pal’s release was missing the production values or high-profile casts of its rivals and was inevitably destined to be nothing more than an also-ran. 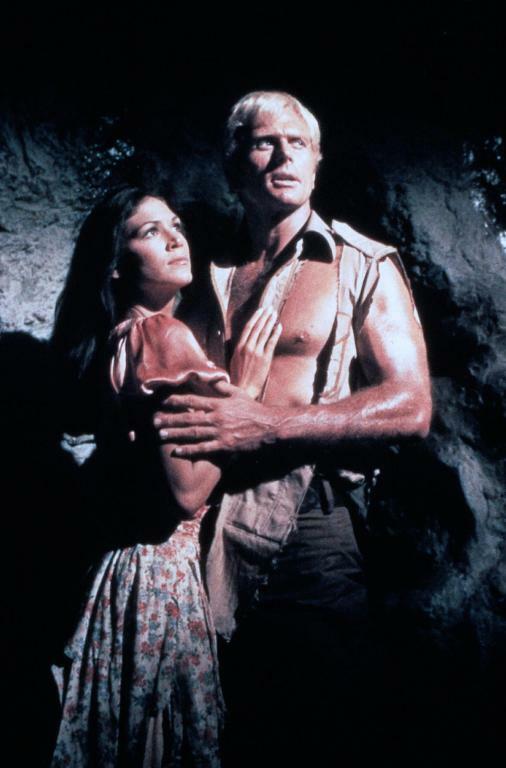 It features an impossibly blue-eyed if charisma-free Ron Ely (formerly the star of the US television show “Tarzan”) surrounded by various well-known and not so well-known TV and B-movie actors of the 1970s hamming it up in fine old style. Given a script that unintentionally careers back and forth between the comic and the camp with the odd flair of the not-so-dramatic or not-so-thrilling the resulting hyperactive acting offers no surprises. Perhaps what is surprising though, especially given the cinematic heritage of George Pal (the man behind 1953′s “The War of the Worlds” and the 1960 Oscar-winning “The Time Machine”), is the mediocre special effects, including the use of almost wilfully fake-looking matte paintings and visuals. They really are poor, more at home in a cheap 1970s’ TV series than a mainstream Hollywood production. Shot in the tame and overly familiar landscapes of southern California or in poorly finished sets that look like rejects from an episode of “Columbo” even the appearance of a dangerous-looking fuselage-free helicopter does little to up the on-screen “wow” factor. From a toe-curlingly awful supervillain who laughs manically at his own deviousness to ethnic stereotypes that span the range of mildly to deeply offensive there is much to be amazed by in Doc Savage. Perhaps the worse offender is a brutal (and I do mean brutal) Scottish accent borne by a stocky would-be assassin. Just about the only thing of real interest is an early appearance of the actress Pamela Hensley who went on to play the sultry alien princess Ardala in the SF television series “Buck Rogers in the 25th Century”. However with all that said Doc Savage is so gloriously silly that one can’t but help at times enjoying it. The fact that those who produced and starred in it obviously thought they were making what could have been a proto-Indiana Jones makes it all the more fun (in an admittedly cruel way). Bare chests (lots of that), dodgy accents, egregious stereotypes, hokey special effects, ratty-looking studio sets… what’s not to enjoy?